Leading the way to "True North"
Cindy Kuhlman-Voss joined VOS in 2010. Cindy has 13 years experience with Toyota – 8 years with TSSC supporting within Toyota and external companies to improve their processes using the principles of TPS and 5 years, first as Manager then Assistant General Manager of Manufacturing at a start-up Toyota casting facility working as part of the team developing the TPS culture from the ground up. 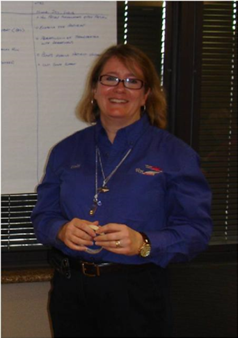 Prior to Toyota, Cindy had 6 years experience as a plant controller and financial analyst for Arvin Industries . Cindy holds a MBA from Indiana University and a BS in Accounting from the University of Evansville.